Hey, if you think it takes a ton of time and a lot of hard work to double your profits, think again! All you need is 10-minutes a day. 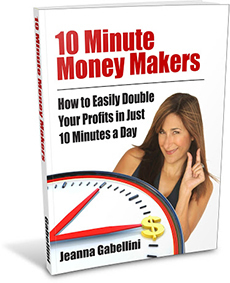 Grab my new ebook 10 Minute Money Makers: How to Easily Double Your Profits in Just 10 Minutes a Dayand discover 14 no-big-deal strategies for making a lot more money now. The #1 key to making a lot more money without working harder, stressing out or doing a bunch of marketing stuff you can’t stand. The cash-killing mistake you want to avoid when you feel strapped for money. 14 easy-breezy profit-doubling strategies guaranteed to plump up your income, your confidence and your love for your business. The most powerful (and often overlooked) money-making resource you have right under your nose! How to super-charge the money-making magnetism of every single thing you do. The trick to plugging up those sneaky leaks where your money may be draining away. The head-slapping, super-obvious (but too often ignored) strategy for bringing in more money right now. Download it now to super-charge the money-making magnetism of every choice you make in your business. Questions? Contact lori @ masterpeacecoaching.com. Jeanna Gabellini is a Master Business Coach who supports conscious entrepreneurs to double (and even triple) their profits by leveraging attraction principles, proven strategies and fun. Her top-tier private coaching and sold-out seminars have allowed committed entrepreneurs to blow past their self-imposed limits, ditch the drama of overwhelm and move into radical joy, inner peace and ever-increasing profits. She is the co-author of Life Lessons for Mastering the Law of Attraction, along with Eva Gregory, Mark Victor Hansen & Jack Canfield. 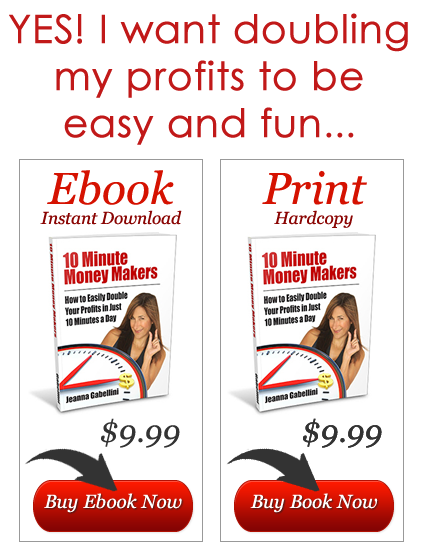 Her newest books are 10 Minute Makers and Rock Your Profits.